Brian became Vicar in April of 2017 following 13 very happy years at Christ Church Fulwood in Preston. As well as being Vicar here he is also the vicar for St John's, Hurst Green and Rector of Ribchester, where he lives. Previously he has been Diocesan Youth Officer for Blackburn Diocese. When he first arrived in Lancashire he was a Lay Youth Worker in Lancaster before getting ordained and served a Curacy at St Gabriel Blackburn. 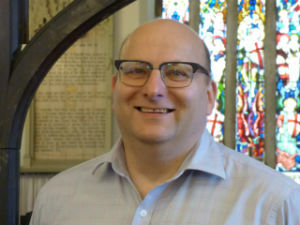 Alongside Parish Ministry, Brian has been Vocations Advisor for the Diocese and is a National Selector helping to discern future Ordained ministry in the Church. In 2015 he was made an Honorary Canon of the Cathedral. He is married to Susan who is a nursery teacher and they have two grown up children. Apart from all things Church, Brian is a Season Ticket holder for Manchester United! 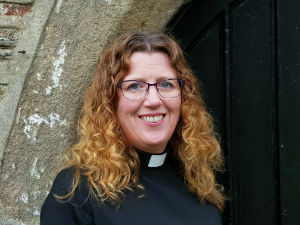 We are delighted to welcome Karen to our parishes in July as our new curate. 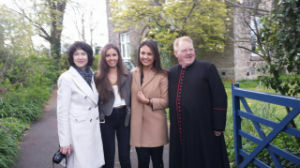 She is living in the Vicarage at St John's, Hurst Green with her husband Stuart and son Xander. We welcome them all to our parishes and hope they will be very happy during their time in the Ribble Valley. Jane was appointed Warden in 2017 and is serving in the role for the 2nd time. Since her marriage to Fred, Mitton has been her Parish Church. Jane is a Registered Nurse, recently retired from the NHS and currently works for the Field Nurse Project based at Auction marts. Jane is also the leader of the Mother's Union Branch for Hurst Green and Mitton. 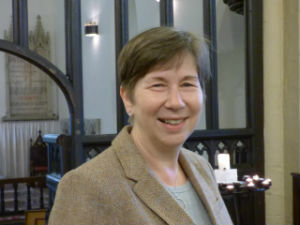 Christine was appointed Warden in April 2019. She has been an active member of the parish for a number of years. More details to follow. Michael and his wife Sarita, first got involved in the All Hallows Church community when they were married at the Church and although living near Wigan at the time they became regular attendees. In 2009 they moved into Church Cottage and Michael took on the role of Verger. 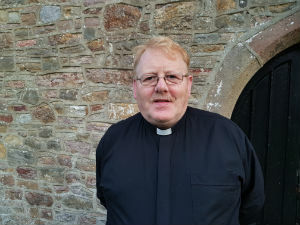 Michael is actively involved in the Church, both practically in looking after the fabric of the Church and churchyard, and also spiritually by leading services on a regular basis. All this and he works full time. Vicky is a headmistress of a primary school and Mum to Charlotte and Maisie and also finds time to be part of the leadership team for a local Brownie pack. She is full of creative ideas to entertain and educate the children during our church services. Her professional experience is invaluable in her role as Parish Safeguarding Officer. For any safeguarding concerns please email her. Geoff was licensed as a lay-reader for both our Churches in 1994 and was then made a Deacon in 2006 and ordained as a Priest the following year. Although he is now retired he is a member of both congregations and takes services at our Churches on a regular basis. Geoff is married to Ann and between them they have four children, all now married. He is a retired lecturer in Building Studies.